Saturday, March 7, 2015, 9 a.m. - 4 p.m.
We are pleased to announce our 13th Annual Arts in Your Classroom Teachers Conference for 2015. The conference will engage K-8 educators in a series of hands-on arts integration workshops, inspirational presentations, and opportunities to network with educators, peers, and artists. This year, the conference will focus on: designED. Design thinking in a K-8 setting cultivates 21st century learning communities by encouraging and supporting risk-taking, empathy, and creative problem-solving. This methodology invites teachers and students to identify complex challenges and create solutions that can impact the world beyond their classroom walls. Our conference goal is to provide an empowering design thinking toolkit that educators can take back to their classrooms to cultivate the sort of creativity and critical thinking that possesses the power to shape worlds. We are pleased to announce that Maureen Carroll of Lime Design will deliver this year’s keynote presentation. Carroll will introduce our theme of design thinking by guiding participants through the prototype-driven, human-centered innovation process. We will focus on developing empathy, imagining new solutions, and creating prototypes in a hands-on and high-energy design challenge. This approach, which has energized business innovation, can be applied to K-12 education with considerable impact. Participants will gain an understanding of the design process, build creative confidence to solve problems of practice within their local settings, and grow their capacity for developing 21st-century learners. How do we get to know our students, make our content relevant, and begin to understand their personal stories? How can we use design and artistic practice to foster the process? In this challenge, we will unravel the historical and contemporary stories stitched into quilts. Touching upon the history of the Amish and the Underground Railroad, this workshop will begin to look at quilting as a language. Participants will be challenged to design and create quilt squares reflective of narratives and personal stories while learning about design, color and shapes as well as applicable math and ELA standards. Ideal for K-2nd grade classrooms and adaptable for older students. Friction, resistance, gravity, and more, this workshop will explore the use of force and Newton’s Laws within the creative process. Leveraging the principals of physics, Andy Goldsworthy fuses art and science in his precariously balanced and elegant works of art. Participants will be challenged to design and build their own sculpture through a collaborative hands-on rock balancing activity deeply rooted in science standards. Ideal for 2nd-5th grade teachers. Repurposing with a purpose, attendees of this workshop will take recycled materials and design another object with it: make a milk jug a toy! Participants will exercise their creativity and practice important skills such as problem solving, teamwork, critical thinking, adaptability, and communication and reference real world scenarios while learning how to design, construct, and prototype solutions. 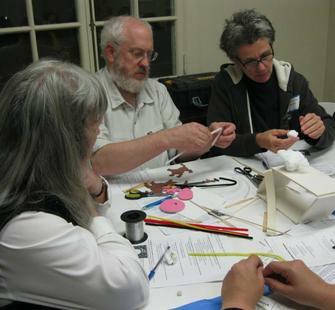 Established out of the Engineering and Design NGSS standards, this workshop is most applicable to 4th and 5th grades. This workshop integrates design thinking methodology into an exploration of computer controllers made from outrageously unexpected materials. Participants will create working prototypes that connect to MakeyMakey devices (provided) and computers to test their creations. Explore combining fun building materials, simple circuitry, and conductivity in this art and engineering design challenge. Established out of the Engineering and Design NGSS standards, this workshop is most applicable to 5th-8th grades. NOTE: Please bring your own laptop! From gourds, bones, bamboo, and wood to dresser drawers, washboards, and steel drums, people have been sourcing their environment to make musical instruments throughout time. In this workshop, we will look at those traditions and prototype our own out of natural and recycled materials. Using mathematic proportions to set our tones and implementing division and fractions as we learn to play, this content can be adapted to a range of ages from K-6th grades.